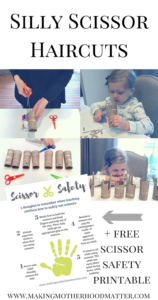 Inside: Find a fun way to practice scissor skills with recycled paper rolls, called silly scissor haircuts. Plus find a scissor safety printable. I love trying out fun activities with my kids. My three-year-old daughter recently started asking if she could use scissors. So, I thought of a fun way for her to practice her scissor skills, with the silly scissor haircuts activity. 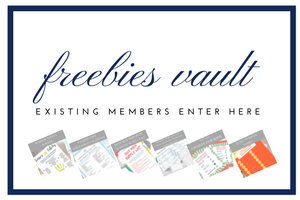 I wanted to also take the opportunity to emphasize how to safely use scissors, which is why I created the free scissor safety printable. Click here to get your free scissor safety printable PDF. 1. Select safe, child-friendly scissors for kids. 2. Always supervise children when they are using scissors. 3. Model how to hold the scissors and keep fingers and body out of the way. Then, help your child get an appropriate grip on the scissors. 4. Reinforce scissors are only for cutting paper, crafts, or other approved materials from an adult. 5. It’s best to sit while using scissors. The adult can carry them point facing down, while walking. To view the silly scissors activity for kids, watch the video below. 1. Cut vertical lines 2/3 of the way down the paper roll, all the way around. 2. Draw a face on each roll. 3. Review scissor safety with your child. 4. 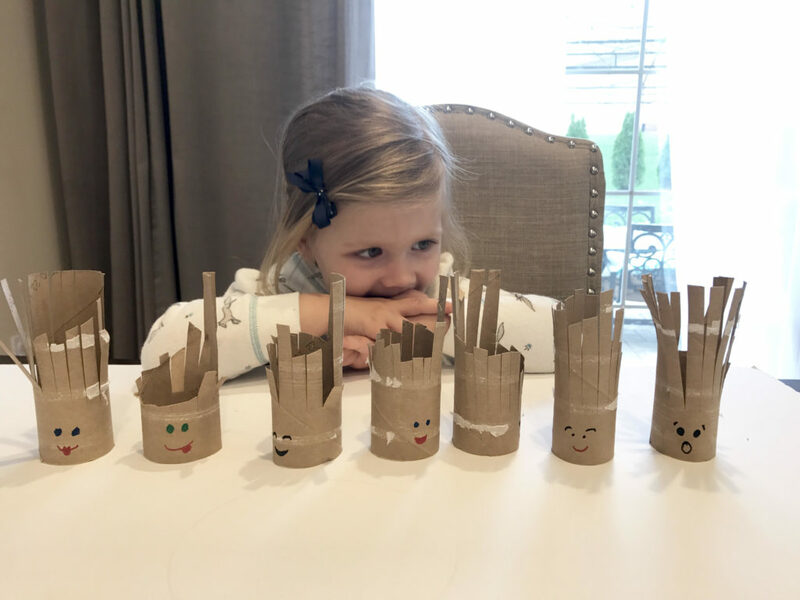 Allow your child to practice giving the paper rolls haircuts. We hope you enjoy this silly scissor haircuts activity as much as we did! P.S. If you enjoyed this piece, you may also like Sick Kids: Ideas for Beating Boredom When You are Stuck at Home. Definitely want to try this! How fun! Hope you love it as much as we did. These are so cute, cheap and simple! I need to do this with my toddler. She loves loves loves using scissors. A little too much. Hahaha. Thanks for sharing!